With the help and coordination from Singapore Polytechnic Student Development Department, Loving Heart was able to gather 48 student volunteers to assist in this event. Jurong Spring Constituency Youth Executive Committee (YEC) organized home cleaning services for two household units on 17th August 2013, as part of their National Day Project. Volunteers from Jurong Spring YEC and Yuhua Secondary School took part in the project. Mr Desmond Lee, Minister of State for National Development and MP for Jurong GRC joined the volunteers in their services, and also helped to clean one of the homes. The volunteers also presented food hamper gifts to the residents at the end of the cleaning. Loving Heart conducted the pre-event briefing for the volunteers, and assisted on that day. Students of Anglo-Chinese School (Independent) Interact Club organised the event for the children of Loving Heart Free Tuition programme on 8th March 2014. The annual event was held at the school campus, as a project to foster relationship with their partnering community organisations. The ACS(I) students planned a wide array of activities for the children, who enjoyed themselves in the various games and handicraft making sessions. The volunteers also taught the children some basic keyboard and first aid knowledge. Gifts and toys were given out to the children at the end of the eventful day. ACS(I) provided transportation, lunch and the gifts. Makino organised an outing for 29 residents from Blue Cross Thong Kheng Home with Loving Heart as the coordinator, accompanied by 9 caregivers and 42 Makino staff and volunteers. A sweater and a pair of socks were given to each of the resident during the outing at the Aquarium. For many of them, it was a new and memorable experience visiting the largest Aquarium in the world. After the visit, the beneficiaries were treated with a sumptuous vegetarian lunch at Grace Court Cuisine Pte. 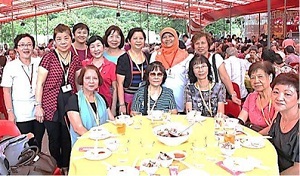 Ltd.
Every year, Yin Sheng Dian would bring the elderly from various Volunteer Welfare Organisations (VWOs) and homes including Loving Heart, Sungei Tengah Road (Farmart) for a grand lunch and a friendly gathering. Yin Sheng Dian continued to put smiles on the faces of elderly who were brought by Loving Heart for lunch this year too. Shimano, who is our partner in the S.T.A.M.P/S.T.R.I.V.E cycling programme, teaches students on bicycle maintenance and cycling etiquette. Shimano organised a mass cycling event for Jurong Secondary and Shuqun Secondary School at Punggol Point Park. The students, staff from Loving Heart, instructors and trainers from Shimano participated in this exciting event. 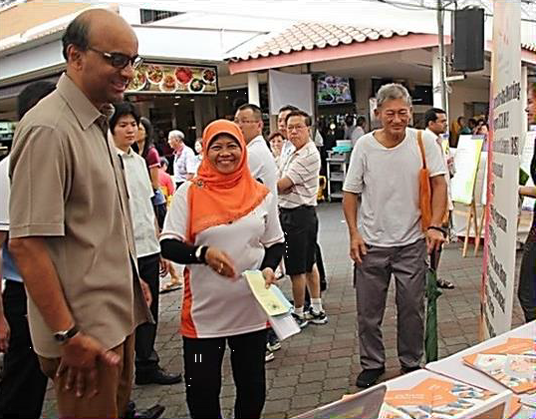 Jurong Spring CC organised a Carnival to reach out to the public on mental illness. 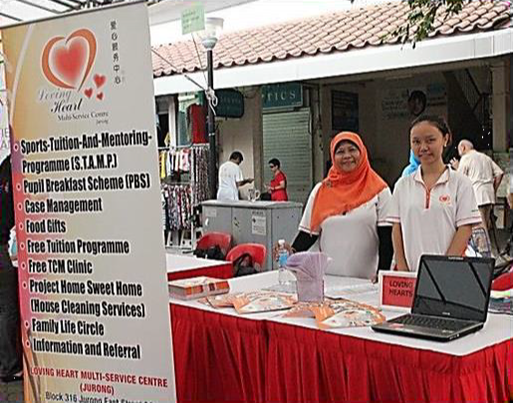 Loving Heart set up a booth to publicize our services and programmes provided for the residents of Jurong GRC. The Guest-of-Honour was DPM Tharman Shanmugaratnam, Minister for Finance and MP for Jurong GRC. Loving Heart student beneficiaries from Jurongville Secondary School were invited to a Mid-Autumn Festival. The Organisers sponsored and issued one hundred pieces of uniform vouchers, valued at $50 each to the students. Guest-of-Honour, Mr Ang Wei Neng, MP for Jurong GRC, presented the vouchers.